A suicide bomber in a small town plans out her last day, getting herself photographed before she goes and blows up the prime minister. A drunkard in a Mumbai slum tries to compete with the torrential rain, even as it washes his dwelling away. An army man at the border has become so accustomed to speaking over the wireless that he ends every sentence with 'Over!' And in the title story, a cop drags a dead cow from Vinayak Rao Patwardhan Road to the adjoining Bapu Road, since the latter is so much easier to spell. From real-life stories about Javed Akhtar, Sahir Ludhianvi and Kuldip Nayyar to tales set in Kashmir, in the hinterland, in the modern megapolis and on the LoC, from anecdotes of love and betrayal to fables of courage and conviction, this is an enthralling collection available in English for the very first time. 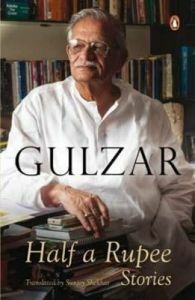 Gulzar is one of India's most respected scriptwriters and film directors and has been one of the most popular lyricists in mainstream Hindi cinema for over five decades. One of the country's leading poets, he has published a number of poetry anthologies and collections of short stories. He is also regarded as one of India's finest writers for children. Apart from many Filmfare and National Awards for his films and lyrics - and an Oscar and Grammy for the song Jai ho - Gulzar has received the Sahitya Akademi Award in 2002 and the Padma Bhushan in 2004. He lives and works in Mumbai.Sunjoy Shekhar was born in Sahibganj, a small, sleepy town in Jharkhand on the banks of the river Ganga. He started work as an editor with a Delhibased publishing house before moving on to writing dramas for television. He has more than 10,000 hours of story-writing credits across a host of television channels in India and Indonesia. He has also translated Gulzar's 100 Lyrics.